Quest will handle all your needs. Agriculture, Real Estate,Structural Inspections, Emergency Services, Fire and Police, Event video and much much more. Call us with your needs and we will deliver. Now FAA Approved for Night Time Operations!!! “We have to do a better job of managing our fields because our chances are so slim,” The US farmer has 40 chances to get the perfect crop, less with a three year rotation. The U.S. farmers need to embrace technology in order to improve. With a drone, or UAV, farmers can capture highly accurate images of their fields, covering up to hundreds of acres in a single flight, without the cost and hassle of manned services. These images are at a greater resolution than satellite imagery provides, even when there is cloud cover. 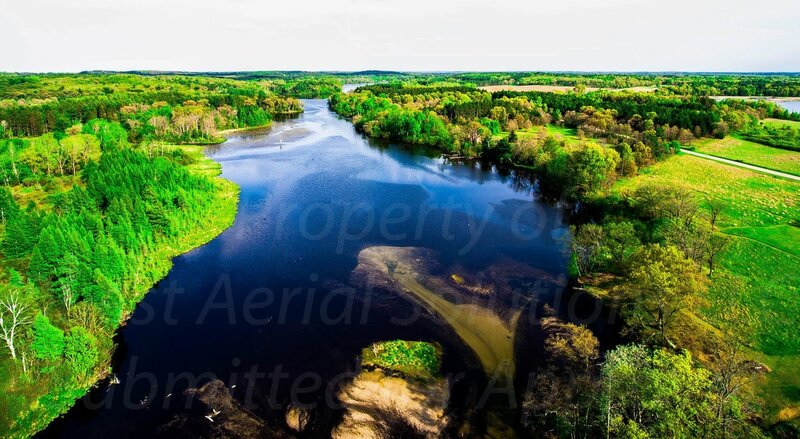 UAV's are available in the Sheboygan Wisconsin and surrounding areas to be used to determine crop yield, weed infestation, drought/Flood effects which traditionally require significant time travelling to the fields, and then only getting a 2D view of the location. UAV's can be launched from a home base either on command, or automatically based on a pre programmed schedule and collect data to analysed in real time. UAV's are changing the way we conduct our business. Search and rescue, Natural disaster, crime scene reconstruction and fire involvement surveillance are sometimes very dangerous situations. UAV's can perform many of these functions faster and more economically that current tactics and do them without risking the lives of others. Applications are being developed to assist in every part of law enforcement and public safety. If you are a law enforcement agency or group from the Sheboygan County, Ozaukee County, Manitowoc County areas please call me for your free demonstrations on how UAV's can be used in emergency services. Bridges, buildings, pipelines, high tension wires, are just a few of the to many to mention applications for structural inspection. UAV's will make these functions faster, easier and safer in the near future. Weddings, graduations, picnics, and family reunions are just a few of the to many to count applications that can be viewed and photographed from a new and amazing perspective. Your organization can have Firefly aerial photography film your public event to get layout information to use for future planning, put together marketing films for future events, get head counts and so many other applications. If you don't see it hear, call us and we will put together a plan to do what ever it is you want to accomplish using UAV's. No challenge is to great. Quest Aerial Solutions s is an American (USA) company located in East Central Wisconsin. WinterGreen Research announces that it has published a new study Commercial Drones: Market Shares, Strategy, and Forecasts, Worldwide, 2015 to 2021. Next generation commercial drones achieve a complete replacement of existing commercial airfreight delivery systems, they are used for 3D mapping, commercial pipeline observation, border patrol, package delivery, photography, and agriculture are more energy efficient, last longer and have a significantly lower cost of operation than manned aircraft. Quantities of fielded systems increase as application usefulness increases. Police departments, the oil and gas industry, border patrol, and utilities are all using commercial drones. Units are used for agriculture. Vendors continue to improve the capabilities of these drone aircraft as more air miles are logged. Their ability to support the commercial endeavors is increasing. Unmanned aircraft have fundamentally changed the accuracy of utility and oil and gas inspections. They are set to fundamentally change how agriculture is conducted. Japan and Australia have been using drones in agriculture since the 1980s. Worldwide markets are evolving for several compelling applications. High value crops are a target of agricultural robotic development. What could be tastier than a strawberry, perfectly formed, and perfectly ripened? New agricultural robots are able to improve the delivery of consistent quality food, and to implement efficiency in managing food production. Strawberries are a high profit crop. A new generation of drones has just been born. Strawberry spraying with the world’s most advanced technology is able to give maximum performance to a farm. Harvesting robots can use pictures from drones to optimize the productivity of the farming business by determining fruit ripeness from the air. Growers can get the best results in a berry farm using automated process. Automated picking collection systems improve labor productivity, give speed and agility to harvest operations. The robotic platforms are capable of site-specific spraying. The capability is targeted spraying only on foliage and selected targets. It can be used for selective harvesting of fruit. The robots detect the fruit, sense its ripeness, then move to grasp and softly detach only ripe fruit. Commercial drones are set to build highways in the sky. The market will only evolve past the early adopter stage after the industry finds ways to build navigation infrastructure that is safe and that works. Roads in the sky will create altitude differences that function as bridges to separate the drones from each other when they are flying at angles to each other. This type of navigation needs to be defined by industry standards groups, much as the software industry has been able to develop industry stands that provide the base for a market, so also, the commercial drone manufacturers need to come together with representatives from each company and from all the governments to decide on the highways in the sky. Another aspect of commercial drone markets is the safety issue. If drones become so prevalent that they fall out of the sky on people or homes, this becomes a problem for the people hit or the people who own the homes that are destroyed. As the air crashes from so long ago in the 1920’s to yesterday illustrate, people are deterred from commercial drone use by air crashes. Crashes can virtually destroy what is promising to be a burgeoning industry of commercial drones. The drone industry is going to need to find a way to prevent injuries on the ground before anyone will support the burgeoning industry in any significant way. In unpopulated areas like to Alaskan oil fields oil pipelines, and utility high wires, there is plenty of space for the drones to make a market. In vast agricultural land areas, drones promise to be able to be used without any danger to humans. The drones create new uses for automated process. The drones are less expensive than manned vehicles and more useful. They are useful in agricultural applications where the cameras are able to do spotting in a manner that is more efficient than the humans can do. Unmanned aircraft systems are achieving a level of relatively early maturity. Fleets of unmanned aircraft systems have begun to evolve. The U.S. Army has achieved one million flight hours for its unmanned aircraft systems fleet. Unmanned aerial systems have good handling characteristics. UAS units are designed to perform high-speed, long-endurance, more covert, multi-mission intelligence, surveillance, and reconnaissance (ISR) and precision-strike missions over land or sea. Drone units feature a variety of internal loads, including 2,000 lb payload, an Electro-optical/Infrared (EO/IR) sensor, and an all-weather GA-ASI Lynx® synthetic aperture radar/ground moving target indicator (SAR/GMTI), maximizing long loiter capabilities. UAS offers the business persistent situational awareness and mission affordability. For the cost of one manned fighter aircraft, multiple-swarm configured units can cover an area of interest, providing 24/7 ISR coverage, target identification, neutralization, mission flexibility, and attrition tolerance. Some drone UAS have the capability to support manned aircraft missions if desired. Drones markets promise to grow significantly because of the better visualization provided by systems. Visualization includes mapping from the air, inspection from the air, surveillance from the air, and package delivery from the air. The unmanned aircraft equipped with cameras are able to do things that cannot be done in any other way. This bodes well for market development. Unmanned aircraft systems promise to achieve a more significant aspect of commercial market presence. Army Unmanned Aircraft Systems flying of 3 million flight hours gives drones market credibility. Eighty eight percent of those hours were logged in combat situations in Iraq and Afghanistan. Unmanned aerial systems (UAS) markets at $609 million in 2014 are forecast to reach $4.8 billion dollars, worldwide by 2021. This is a sizable market growth with oil and gas mapping, utility line inspection, package delivery, and agricultural applications accounting for virtually all the unit sales. Drones can provide more information at less cost than a human inspection team can.